Down on your belly to appreciate Lappula redowski. Flowers are no more than a speck of blue or white and the plant is often no more than three inches tall. Lappula redowski has soft, minutely, hairy leaves and stems with a tint of maroon and the stem leaves are cupped and nearly vertical. Numerous flowers deck various angles of Lappula redowski. 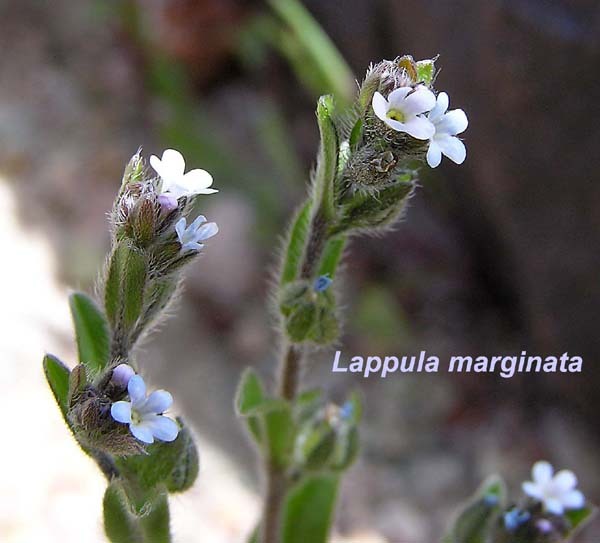 Where you find one plant, you will usually find many and they often will be growing in the same habitat as their Boraginaceae cousins, Oreocarya and Cryptantha. "Lapp" is Latin for "bur".